Athletics, also known as track and field or track and field athletics, is a collection of sports events that involve running, throwing, and jumping. An athlete is a person engaging in these events, although the term can also refer to physically fit persons in many related sports. The name is derived from the Greek word "athlon" meaning "contest." Some languages such as German and Russian refer to these sports as "light athletics" to differentiate them from sports like weight lifting, wrestling, and so on. A stadium-length foot race was the original event at the first Olympics in 776 B.C.E. In the classical era, the Panhellenic Games were held throughout Europe. Later, The Roman Games stressed the Greek sports of chariot racing and wrestling, along with the Etruscan sport of gladiatorial combat. The Celts, Teutons, and Goths, who succeeded the Romans, engaged in athletic contests for combat training. In the Middle Ages, noblemens' sons engaged in running, leaping, and wrestling contests. The formal organization of modern athletic events began with amateur footraces held in England beginning in 1825, with the first regular series of meetings held at Exeter College, Oxford in 1850. The Amateur Athletic Club (AAC), founded in 1866, held the first English championship games for unpaid "gentlemen amateurs." The AAC was replaced by the Amateur Athletic Association as the overseeing body. 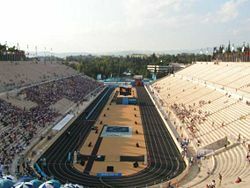 Modern athletic events are organized around a 400-meter running track, with field events (vaulting, jumping, and throwing) often taking place inside the track. Athletics remain the central activity of the modern Olympic Games, begun in 1896. Today, there are two seasons for track and field: An indoor season, run during the winter and an outdoor season, run during the spring and summer. High schools and colleges have track-and-field programs and facilities (primarily outdoors), with meets being held on the local, state, and regional levels. Athletes can now receive money for track-and-field competition, under the auspices of professional athletic associations. Training ground for ancient Olympic athletes. Athletics was the original event at the first Olympics in 776 B.C.E. where the only event held was the stadium-length foot race or stadion. During the ancient Olympics normally only young men could participate. Competitors were usually naked, not only as the weather was appropriate but also as the festival was meant to be, in part, a celebration of the achievements of the human body. Later, the pentathlon was an athletic event in the Olympic Games and other Panhellenic Games of Ancient Greece. The name derives from the Greek words for "five competitions." The five events were the stadion and wrestling, which were also held as separate events; and the long jump, javelin throw, and discus throw, which were not held as a combined contest. Pentathletes were considered to be among the most skilled athletes, and their training was often part of military service—each of the five events was thought to be useful in battle. If the same man won the long jump, discus throw, and javelin throw, there was no need to hold the stadion and wrestling events, although they would still be held separately. In the case of multiple winners, the winner of the stadion was considered the champion of the entire Games, and was often the only name remembered in connection with a particular Games, especially during the earliest period. There were several other "Games" held throughout Europe in the classical era, including the Panhellenic Games. The Pythian Games (Delphic Games, founded in 527 B.C.E.) were one of the four Panhellenic Games of Ancient Greece, a forerunner of the modern Olympic Games, held every four years at the sanctuary of Apollo at Delphi. They were held in honor of Apollo two years after each Olympic Games were held, and between each Nemean Games (founded in 523 B.C.E. and held on the Isthmus of Corinth) and Isthmian Games (founded in 516 B.C.E. and held in Argolid every two years). 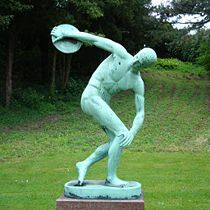 Statue of a discus thrower. The Panhellenic Games, unlike the Olympic Games, also featured competitions for music and poetry, which pre-dated the athletic portion of the contests, and were said to have been started by Apollo after he killed Python and set up the oracle at Delphi. Otherwise, the athletic events were the same as the Olympic Games. A four-horse chariot race was held in a hippodrome on the plain not far from the sea, in the place where the original stadium was sited. The winners received a wreath of bay laurels from the city of Tempe in Thessaly. Smaller Pythian games were celebrated in many other cities of Asia Minor and Greece. There is no doubt that most Romans also came to prefer games of a more physically dangerous and violent nature than did the Greeks. The Romans absorbed many Greek social and cultural ideas, especially after Rome's conquest of the Greek lands of the eastern Mediterranean in the second and first centuries B.C.E. However, except for boxing and chariot racing, most Romans had little interest in Greek athletics, in which serious injuries and death were rare. The average Roman had a dislike for the running, jumping, and throwing events of the Olympics. Instead, the Greek sports of chariot racing and wrestling, as well as the Etruscan sport of gladiatorial combat, took center stage in the Roman Games, culminating in wild animal hunts and Public spectacles (munera) that took place in amphitheaters (like the Colosseum). Other peoples enjoyed athletic contests, such as the Celts, Teutons, and Goths. However, these were often related to combat training. In the Middle Ages, the sons of noblemen would be trained in running, leaping, and wrestling, in addition to riding, jousting, and arms-training. Contests between rivals and friends may have been common on both official and unofficial grounds. In the nineteenth century, the formal organization of the modern events started with organized amateur footraces held in England beginning in 1825. The incorporation of regular sports and exercise into school regimes also began. The Royal Military College, Sandhurst, has claimed to be the first to adopt this in 1812 and 1825, but without any supporting evidence. The earliest recorded meeting was organized at Shrewsbury, Shropshire in 1840, by the Royal Shrewsbury School Hunt. There are details of the meeting in a series of letters written 60 years later by C.T. Robinson who was a pupil there from 1838 to 1841. The Royal Military Academy at Woolwich held an organized competition in 1849, but the first regular series of meetings was held by Exeter College, Oxford from 1850. The first meet open to all amateurs was organized by the West End Rowing Club in 1861. Founded in 1866, the Amateur Athletic Club (AAC) held the first English championship games, which stressed the camaraderie of its participants, who were unpaid "gentlemen amateurs." In 1880, the AAC was replaced by the Amateur Athletic Association as the controlling sports authority. The Panathenaic Stadium in Athens, originally built in the fourth century B.C.E., was restored for use in the 1896 Olympics and updated again for the 2004 Summer Olympics. 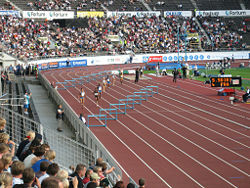 Modern athletic events are usually organized around a 400m running track on which most of the running events take place. Field events (vaulting, jumping, and throwing) often take place inside the track. Athletics was included in the first modern Olympic Games, in 1896, and has formed their backbone since. After the initial success, the Olympics struggled. The celebrations in Paris (1900) and St. Louis (1904) were overshadowed by the World's Fair exhibitions in which they were included. The so-called Intercalated Games (because of their off-year status, as 1906 is not divisible by four) were held in 1906 in Athens, as the first of an alternating series of Athens-held Olympics. Although originally the IOC recognized and supported these games, they are currently not recognized by the IOC as Olympic Games, which has given rise to the explanation that they were intended to mark the tenth anniversary of the modern Olympics. The 1906 Games again attracted a broad international field of participants (in 1904, 80 percent had been American) and great public interest, thereby marking the beginning of a rise in the popularity and size of the Games. Women were first allowed to participate in track and field events in the Olympics in 1928. An international governing body, the International Association of Athletics Federations IAAF was founded in 1912. The IAAF established separate outdoor World Championships in 1983. There are a number of regional games as well, such as the European Championships, the Pan-American Games, and the Commonwealth Games. In addition, there is a professional Golden League circuit, culminating in the IAAF World Athletics Final and indoor championships such as the World Indoor Championships. The sport has a very high profile during major championships, especially the Olympics, but otherwise is less popular. The AAU (Amateur Athletic Union) was the governing body in the United States until it collapsed under pressure from advancing professionalism in the late 1970s. A new governing body called The Athletics Congress (TAC) was formed; it was later renamed USA Track and Field (USATF or USA T&F). An additional, less-structured organization, the Road Runners Club of America (RRCA) also exists in the United states to promote road racing. Today, there are two seasons for track and field: an indoor season, run during the winter and an outdoor season, run during the spring and summer. Many high schools and colleges have track-and-field programs and facilities (primarily outdoors), with meets being held on the local, state, and regional levels. Athletes can now receive money for track-and-field competition, putting an end to the so-called "amateurism" that existed before. Most indoor tracks are 200 meters and consist of four to six lanes. Often an indoor track will have banked turns to compensate for the tight bends. In an indoor track meet athletes contest the same track events as an outdoor meet with the exception of the 100 m and 110 m/100 m hurdles (replaced by the 60 m sprint and 60 m hurdles at most levels and sometimes the 55 m sprint and 55m hurdles at the high school level), and the 10,000 m run, 3000 m steeplechase, and 400 m hurdles. Indoor meets also have the addition of a 3000 m run normally at both the collegiate and elite level instead of the 10,000 m. The 5000 m is the longest event commonly run indoors, although there are situations where longer distances have been raced. In the mid twentieth century, there was a series of "duel races" at Madison Square Garden's (NY) indoor track, some of which featured two men racing a marathon (26.2 miles). However, this is an extremely rare occurrence, for obvious reasons. In some occasions, there may also be a 500 m race instead of the open 400 m normally found outdoors, and in many collegiate championship indoor races, both are contested. In field events, indoor meets only feature the high jump, pole vault, long jump, triple jump and shot put. The longer throws of javelin, hammer and discus are added only for outdoor meets, as there is normally not enough space in an indoor stadium to house these events. Other events unique to indoor meets (especially in North America) are the 300, 600, 1000, and 35 lb. weight throw. In some countries, notably Norway, the standing long jump and standing high jump are also contested, even in the National Championships. For multi-event athletes there is the Pentathlon for women (consisting of 60 m hurdles, high jump, shot put, long jump and 800 m) and heptathlon for men (consisting of 60 m, long jump, shot put, high jump, 60 m hurdles, pole vault and 1000 m) indoors. Outdoor there is the heptathlon for women and the decathlon for men. Typical oval track. Not all tracks are oval. Some consist of two semicircles joined by straight segments. The outdoor track and field season usually begins in the spring and lasts through the summer. Most tracks are ovals of 400 meters in circumference. However, some older tracks are 440 yards in length, while there are some tracks that are neither oval nor 400m/440y due to geographic considerations. Modern tracks are made with a rubberized surface, while older tracks may be made of dirt or cinders. Tracks normally consist of 6-10 lanes and many include a steeplechase lane with a water pit on one of the turns. This steeplechase pit can be placed either inside or outside the track, making for a tighter turn or a wider turn. It is common that tracks will surround a playing field used for American football, football (soccer), or lacrosse. This inner field is usually known as the infield and has a surface of either grass or artificial turf. All field events can be contested on the infield. However the javelin, hammer and discus throws are often contested on fields outside of the track stadium because they take up a large amount of space, the implements may damage the infield, and the implements could end up landing on the track. There are other variations besides the ones listed below, but races of unusual length (for example, 300 m) are run much less often. The unusual races are typically held during indoor season because of the shorter 200 m indoor track. With the exception of the mile run, races based on imperial distances are rarely run on the track anymore since most tracks have been converted from a quarter mile (402.3 m) to 400 m; almost all record-keeping for imperial distances has been discontinued. However, the IAAF record book still includes the mile world record (currently held by Hicham El Guerrouj of Morocco for men and Svetlana Masterkova of Russia for women) because of its worldwide historic significance. Men and women do not compete against each other, although they may sometimes run in the same races due to time constraints at high school meets. Women generally run the same distances as men although hurdles and steeplechase barriers are lower and the weights of the shot, discus, javelin and hammer are less. Athletes compete in a steeplechase. Steeplechase: A race (usually 3000 m) in which runners must negotiate barriers and water jumps. Long distance: Runs over 5000 m. Common events are 5000 m and 10000 m. Less common are 1, 6, 12, 24 hour races. Hurdling: 110 m high hurdles (100 m for women) and 400 m intermediate hurdles (300 m in some high schools). Relays: 4 x 100 m relay, 4 x 400 m relay, 4 x 200 m relay, 4 x 800 m relay, and so on. Some events, such as medley relays, are rarely run except at large relay carnivals. Typical medley relays include the distance medley relay (DMR) and the sprint medley relay (SMR). A distance medley relay consists of a 1200 m leg, a 400 m leg, an 800 m leg, and finishes with a 1600 m leg. A sprint medley relay consists of a 400 m leg, 2 200 m legs, and then an 800 m leg. Most American high schools run the 4x100, 4x400 and 4x800 with the 4x400 being the finishing event to the meet. Road running: Conducted on open roads, but often finishing on the track. Common events are over 5 km, 10 km, half-marathon and marathon, and less commonly over 15 km, 20 km, 10 miles, and 20 miles. The marathon is the only common road-racing distance run in major international athletics championships such as the Olympics. Race walking: Usually conducted on open roads. Common events are 10 km, 20 km, and 50 km. 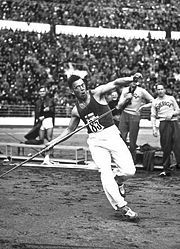 Matti Järvinen is throwing the javelin at the 1932 Summer Olympics. Shot put: Competitors take their throwing a heavy metal ball (of varying weights depending on the level of competition) from inside a circle seven feet in diameter, with a toe board approximately four-inches high at the front of the circle. The distance thrown is measured from the inside of the circumference of the circle to where the shot lands at its nearest disturbance of the soil. Hammer throw: The object to be thrown is a heavy steel ball attached with wire (maximum length, four feet) to a handle. The competition is decided by who can throw the ball the farthest. The men's hammer weighs 16 pounds and the women's hammer weighs 8.82 pounds. Competitors gain maximum distance by spinning the hammer above their head to set up the circular motion. Then they apply force and pick up speed by completing one to four turns in the circle. In competition, most throwers turn three or four times. Javelin throw: Involves throwing the javelin, a spear-like object made of metal, fiberglass and, in some cases, carbon fiber. Competitors take three throws after which the top eight take another three, their best legal throw is recorded and the winner is the individual with the longest legal throw, measured to the nearest foot and inch depending on country of competition. If the javelin's point touches the ground first, the throw is marked (measured) from this point. Discus throw: The discus, the object to be thrown, is a heavy lenticular disc with a diameter of 8.66 inches and a weight of four pounds, seven ounces for the men's event, and two pounds, three ounces for the women's, with a smaller diameter of 7.17 inches. To make a throw, the competitor starts in a slightly recessed concrete-surfaced circle of eight feet, 2½ inches diameter. The thrower typically takes an initial stance facing away from the direction of the throw. He then spins around one and a half times through the circle to build momentum, then releases his throw. High jump: In this event, competitors must jump over a horizontal bar placed at measured heights without the aid of any devices. In a competition, the bar is initially set at a relatively low height, and is moved upward in set increments (approximately 2 inches), but can be lessened for record attempts. Each competitor has the option of choosing at which height they wish to start, as long as the height is greater or equal to the designated starting height for that competition. The starting height is usually determined by the games committee for the competition. Pole vault: An event where a person uses a long, flexible pole (which today are usually made either of fiberglass or carbon fiber) as an aid to leap over a bar. 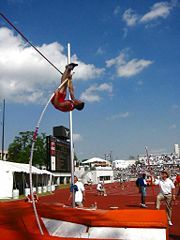 Although there are many techniques used by vaulters at various skill levels to clear the bar, the generally accepted technical model can be broken down into several phases: The approach, the plant and take-off, the swing and throw, the extension, the turn, and the fly-away. Long jump: Competitors sprint down a runway (usually coated with the same rubberized surface as running tracks, crumb rubber, or vulcanized rubber) and jump as far as they can off of a wooden board into a pit filled with finely ground gravel or sand. The distance traveled by a jumper is often referred to as the “mark,” because it is the distance to which the first mark is made in the sand. More specifically, a mark is the minimum distance from the edge of the takeoff board nearest the landing pit, to the first indentation made by the competitor. If the competitor starts the leap with any part of the foot in front of the board, the jump is declared illegal and no distance is recorded. Triple jump: Previously also known as "hop, step, and jump," whose various names describe the actions a competitor takes, in the triple jump the athlete runs down a runway until he reaches a designated mark, from which the jump is measured. The takeoff mark is a board, and in modern championships a strip of plasticine or modeling clay is attached to the board to record athletes overstepping the mark. The first landing has to be done with the takeoff foot. The next phase is a step, landing on the opposite foot, and is followed by the jump into a sand-filled box, as in the long jump. A "foul," or missed jump, occurs when a jumper oversteps the launch mark (most commonly), misses the pit entirely, or does not perform the attempt in the allotted amount of time (usually about one minute). Other jumping events, now uncommon, include the Standing high jump, Standing long jump, and the Standing triple jump. Pentathlon: In addition to the Modern Pentathlon, there has also been an athletics pentathlon event for women in the modern Olympic Games. The first Olympic competition was at the 1964 Summer Olympics in Tokyo. The events of the pentathlon, in order, were: 80-meter hurdles, shot put, high jump, long jump, and the 200 meters. The javelin and the 800 meters were added in the 1984 Summer Olympics to create the women's heptathlon. The hurdles race also became 100 meters. Heptathlon: There are two versions of the heptathlon. The first is an outdoor competition for women, and is the combined event for women contested in the Athletics program of the Olympics and in the IAAF World Championships in Athletics. The IAAF World Combined Events Challenge determines a yearly women's heptathlon champion. The women's outdoor heptathlon consists of the following events, with the first four contested on the first day, and the remaining three on day two: 100 m hurdles, high jump, shot put, 200 m, long jump, javelin throw, and 800 m. The other version is an indoor competition, normally contested only by men. It is the men's combined event in the IAAF World Indoor Championships in Athletics. The men's indoor heptathlon consists of the following events, with the first four contested on the first day, and remaining three on day two: 60 m, long jump, shot put, high jump, 60 m hurdles, pole vault, and 1000 m. The scoring is similar for both versions. In each event, the athlete scores points for his/her performance in each event according to scoring tables issued by the International Association of Athletics Federations (IAAF). The athlete accumulating the highest number of points wins the competition. Decathlon: This event combines 10 track-and-field events, which are held over two consecutive days with the winners determined by the combined performance in all events. Performance is judged on a points system in each event, not by the position achieved. The decathlon is contested by male athletes, while female athletes contest the Heptathlon. The decathlon is a menu of athletic events, testing an individual’s speed, strength, skill, endurance, and personality. The decathlon includes five events on each of two successive days. The first day schedules the 100-meter run, long jump, shot put, high jump, and 400 meters. It is a day of speedy movement, explosive power, and jumping ability. Day two consists of the 110-meter hurdles, discus, pole vault, javelin, and 1500 meters. The importance of this day is on technique and endurance. Arlott, John. Oxford Companion to Sports and Games. Oxford University Press, 1975. ISBN 9780192115386. Cook, Gray. Athletic Body in Balance. Human Kinetics Publishers, 2003. ISBN 978-0736042284. Mazzoni, Wayne. The Athletic Recruiting & Scholarship Guide. Mazz Marketing, Inc., 2005. ISBN 978-0966355772. Rogers, Joseph L. USA Track & Field Coaching Manual. Human Kinetics Publishers, 1999. ISBN 978-0880116046.
International Association of Athletics Federations (IAAF). Official site. www.iaaf.org. World Masters Athletics. Official site. www.world-masters-athletics.org. Masters T&F World Rankings. www.mastersathletics.net. Track and Field News. www.trackandfieldnews.com. World Track and Field Results and News. www.sprintic.com. History of "Athletics (track and field)"
This page was last modified on 23 April 2016, at 20:43.